On June 7, five current and former elected officials and past candidates gathered at the University of Toronto’s Multi-Faith Centre to celebrate the launch of Women Win TO, an organization that aims to support and teach women and gender nonconforming people how to thrive and succeed when seeking election for public office. As part of the Toronto Women’s City Alliance, Women Win TO is intended to make women and gender nonconforming people feel more welcome in the political realm. The initiative comes prior to the 2018 municipal election. Former MP Olivia Chow delivered the opening remarks at the event, reflecting on the messages she wished to imbue during her 2014 bid for Mayor of Toronto and what parts of her platform were lost in the campaign process. The panelists in attendance were Alejandra Bravo, the Director of Leadership and Training at the Broadbent Institute and former Ward 17 candidate; Ausma Malik, Toronto District School Board (TDSB) Ward 10 Trustee; Tiffany Ford, TDSB Ward 4 Trustee; and Kristyn Wong-Tam, Ward 27 City Councillor. Jennifer Hollett, head of news and government at Twitter Canada, digital director of Olivia Chow’s 2014 mayoral campaign, and the NDP candidate for University—Rosedale in the 2015 federal election, moderated the panel. The panelists, many of whom had several intersecting identities, noted how many unanticipated problems accompany the campaign process. Councillor Kristyn Wong-Tam described her work on implementing a gender responsive budget at City Hall, which applies an intersectional feminist lens to take all residents’ needs into consideration when making budgetary decisions. As the only openly gay woman elected to the position of city councillor, Wong said it has been challenging for her to convince the council to invest more in policies affecting minorities and youth. Won-Tam expressed the difficulty that she faced in having to explain and deconstruct these problems and their consequences on society as a whole. Trustee Ausma Malik provided an account of discrimination on her campaign, during which she and her team were harassed online by racist and Islamophobic trolls. While she had not expected online harassment to become so central to her campaign, she thanked the groups that stood in solidarity with her throughout the ordeal and ultimately helped her to win the election. Directly responding to the discrimination Malik faced on the campaign trail, Malik said she was able to let it fuel her campaign. She noted that while being the first elected official in Canada who wears a hijab is indeed a feat, it’s important that she not be the last. The idea of solidarity was consistently raised by the panel at Women Win TO — that strong support networks, whether personal or professional, are essential to wellbeing and success in politics. When The Varsity asked what the panelists would like to see on a mayoral campaign platform in 2018, their responses varied. Hollett highlighted the rate at which people are being priced out of the city, which has made it increasingly inaccessible to new immigrants and impedes the diversity that the city is known for. Bravo asked for greater focus on providing living wages, affordable housing, transit, and childcare. Many of the participants and attendees that The Varsity spoke to felt hopeful about the kind of collaboration that has been fostered and encouraged by their elected officials. Event attendee Hanan Mohamed expressed interest in applying to the program, but stressed the necessity for hands-on workshops, such as mock canvassing, to give women a greater advantage when they eventually go through the process themselves. 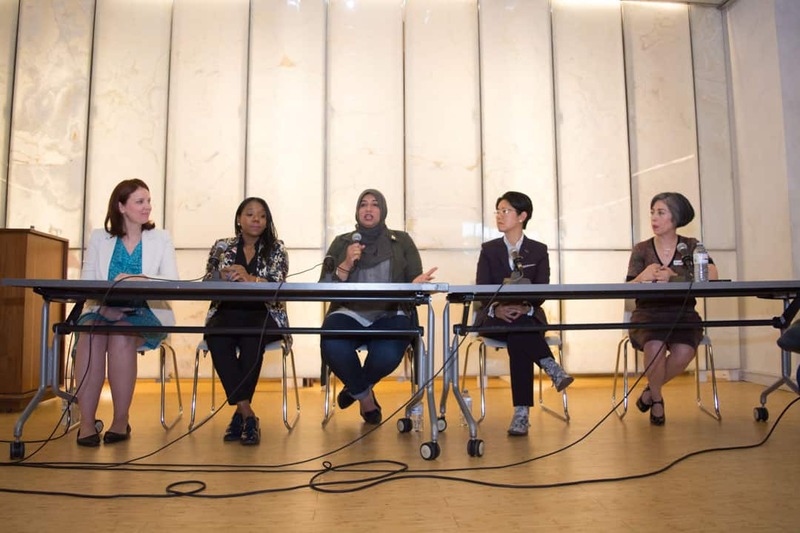 Overall, the panelists encouraged a diversity of women to run for public office, and to make public offices more representative of the city’s diverse population. Women interested in running for political office were encouraged to register for the Women Win TO workshop program. The application process to be part of the Women Win TO program runs from June 8 to July 17.